The Rhynie Chert in Scotland is a Devonian age deposit containing fossils of both zosterophylls and trimerophytes, some of the earliest vascular plants. This indicates that prior to the start of the Devonian, the first major radiations of plants had already happened. 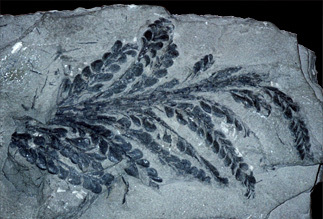 The oldest known vascular plants in the Northern Hemisphere are from the Devonian Period. The vegetation of the early Devonian consisted primarily of small plants, the tallest being only a meter tall. By the end of the Devonian, ferns, horsetails and seed plants had also appeared, producing the first trees and the first forests. At left, the fern-like leaves of Archaeopteris, one of the first tree-like plants. It grew to an average height of about 10 meters, produced spores, and had a global distribution. At right, a beautifully pyritized Devonian brachiopod, Paraspirifer bownockeri, from Ohio. During the Devonian, two major animal groups colonized the land. The first tetrapods  land-living vertebrates  appeared during the Devonian, as did the first terrestrial arthropods, including wingless insects and the earliest arachnids. 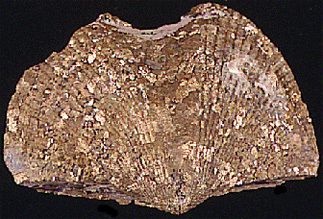 In the oceans, brachiopods flourished. Crinoids and other echinoderms, tabulate and rugose corals, and ammonites were also common. Many new kinds of fish appeared. During the Devonian, there were three major continental masses: North America and Europe sat together near the equator, with much of their current area covered by shallow seas. To the north lay a portion of modern Siberia. A composite continent of South America, Africa, Antarctica, India, and Australia dominated the southern hemisphere. The Devonian seas were dominated by brachiopods, such as the spiriferids, and by tabulate and rugose corals, which built large reefs in shallow waters. Encrusting red algae also contributed to reef building. In the Lower Devonian, ammonoids appeared, leaving us large limestone deposits from their shells. Bivalves, crinoid and blastoid echinoderms, graptolites, and trilobites were all present, though most groups of trilobites disappeared by the close of the Devonian. The Devonian is also notable for the rapid diversification in fish. Benthic, jawless, armored fish are common by the Lower Devonian. These early fish include a number of different groups. By the the Middle Devonian, placoderms, the first jawed fish, appear. Many of these grew to large sizes and were fearsome predators. Of the greatest interest to us is the rise of the first sarcopterygians, the lobe-finned fish, which eventually produced the first tetrapods just before the end of the Devonian. By the Devonian Period, colonization of the land was well underway. Before this time, there was no organic accumulation in the soils, resulting in soils with a reddish color. This is indicative of the underdeveloped landscape, probably colonized only by bacterial and algal mats. By the start of the Devonian, early terrestrial vegetation had begun to spread. These plants did not have roots or leaves like most plants today, and many had no vascular tissue at all. They probably spread vegetatively, rather than by spores or seeds, and did not grow much more than a few centimeters tall. These plants included the now extinct zosterophylls and trimerophytes. The early fauna living among these plants were primarily arthropods: mites, trigonotarbids, wingless insects, and myriapods, though these early faunas are not well known. By the Late Devonian, lycophytes, sphenophytes, ferns, and progymnosperms had evolved. Most of these plants have true roots and leaves, and many grew quite tall. The progymnosperm Archaeopteris (see photo above) was a large tree with true wood. It was the oldest known tree until the 2007 identification of Wattieza in 2007. By the end of the Devonian, the first seed plants had appeared. This rapid appearance of so many plant groups and growth forms has been called the "Devonian Explosion." Along with this diversification in terrestrial vegetation structure, came a diversification of the arthropods. Significant changes in the world's geography took place during the Devonian. During this period, the world's land was collected into two supercontinents, Gondwana and Euramerica. These vast landmasses lay relatively near each other in a single hemisphere, while a vast ocean covered the rest of the globe. These supercontinents were surrounded on all sides by subduction zones. With the development of the subduction zone between Gondwana and Euramerica, a major collision was set in motion that would bring the two together to form the single world-continent Pangea in the Permian. In addition to global patterns of change, many important regional activities also occurred. The continents of North America and Europe collided, resulting in massive granite intrusions and the raising of the Appalachian Mountains of eastern North America. Vigorous erosion of these newly uplifted mountains yielded great volumes of sediment, which were deposited in vast lowlands and shallow seas nearby. Extensive reef building, producing some of the world's largest reef complexes, proceeded as stromatoporoids and corals appeared in increasing numbers. These were built in the equatorial seas between the continents. Large shallow seas in North America, central Asia, and Australia became basins in which great quantities of rock salt, gypsum, and other minerals precipitated. Near the end of the Devonian, a mass extinction event occurred. Glaciation and the lowering of the global sea level may have triggered this crisis, since the evidence suggests warm water marine species were most affected. Meteorite impacts have also been blamed for the mass extinction, or changes in atmospheric carbon dioxide. It is even conceivable that it was the evolution and spread of forests and the first plants with complex root systems that may have altered the global climate. Whatever the cause, it was about this time that the first vertebrates moved onto the land. See this excellent University Münster website on The Rhynie Chert and its Flora. Visit Falls of the Ohio State Park, the largest exposed Devonian fossil bed in the world. Find out more about the Devonian paleontology and geology of North America at the Paleontology Portal. See the Wikipedia page on the Devonian.